Obeisance to Lord Subrahmanya - every one knows. Starts auspiciously with ShrI and has a double namasthE. If you say something more than once, you have said it infinite number of times.We have seen 'pOttri pOttri' and 'Jaya Jaya Sankara', and BrahmasUtram's every phrase ends with twice-repeated words. 'namasthE namasthE'. 'thE' - to you; 'nama:' - obeisance. 'nama:thE' becomes 'namasthE'. The whole kriti goes in the fourth person(? )(nAlam vEtrumai). Obeisances to you, SubrahmanyA, infinite number of obeisances. Who is Subrahmanya? True, learned Brahmanya. We generally take 'brahmA' to mean the true, absolute form of the Lord (paramAtma svarUpam), but there is another meaning - Vedas. That is why, Upanayanam, the ceremony to begin Veda lessons to a child, is called 'BrahmOpadEsam'; by learning Vedas, the child becomes 'BrahmachAri'. Likewise 'Brahmayagnam'. Brahmins are a set that recite the Vedas. Subrahmanya is the symbol of the Divine, the end point, the God of Vedas, and the special God of the Brahmins. and teach Vedas. Adisankara in his 'Subrahmanya Bhujangam' says 'mahIdEva dEvam, mahAvEda bhAvam, mahAdEvabAlam'. 'mahIdEva' are Brahmins; 'mahIdEva dEvam' is God of Brahmins. In Thirumurugattruppadai, one of the oldest Tamil scriptures, this point is underlined. Nakkeerar, the author, stating that each of the six faces of Shanmukha grants devotees' wishes in one different way, says 'oru mugam manthra vidhiyin marapuli vazhA anthanar vELviyOrkkummE'. And when describing Thiruveragam (Swamimalai), he says learned and pious Brahmins perform rituals with fire towards Subrahmanya. Brahmins who participate in 'yagna karmA' are called 'rithvik'. Of the sixteen types of rithviks, one is named 'Subrahmanya'. he even breathed his last singing 'mIna lOchani pAcha mOchani' on Meenakshi. But his birth, beginning of his composing career, were are all associated with Subrahmanya. His very name, Muthuswami, is that of Muthukumaraswami, the deity at Vaidheeswaran koil. His father, Ramaswami Dikshitar - scholar, musician and Srividya devotee - was without an issue till he was forty. He visited Vaidheeswaran koil with his wife and fasted for 45 days (one mandalam). His wife then had a dream as if someone was tying coconut, fruits and other 'mangalavastu' on her womb. And soon she became pregnant. The couple understood that Subrahmanya had granted their wish and that the dream meant this. And a boy was born on 'krithikai' day in the month of Phalguni or Panguni. That boy was Muthuswami. He grew up, had his musical training, Srividya Abhyasam (training in the worship of Devi) and gurukula vAsam at Kashi (Benares). 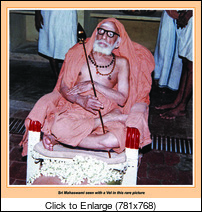 His guru at Kashi, before dying, told Muthuswami, "Go back to the south. First visit Tiruttani. Subrahmanya will show you the way to your life's purpose". So Muthuswami went to Tiruttani. He had his bath in the temple tank and was climbing the hillock, when an elderly Brahmin gentleman called him by name, and told him to open his mouth. When Muthuswami did so, he dropped a piece of sugar candy (karkandu) in his mouth and disappeared. Muthuswami understood who it was that came, and his life's mission began that moment - his musical creativity had been woken up. On the spot, he sang eight kritis. (in eight different 'vEttrumai's). Also note that his 'mudra' is 'guruguhA', a name of Subrahmanya. Guha resides deep inside a cave - guhai; and guruguha resides in the deep cave of the human heart of Muthuswami Dikshitar. Dikshitar's life on earth ended on a Deepavali day. The sixth day from Deepavali is 'skanda shashti'. Some people fast these six days, beginning on Deepavali day and ending it on the shashti day. So in his death too we see the Subrahmanya association. Like two 'namasthE's, two koti's. koti-koti is koti (one crore) multiplied by crore. manasija koti koti - crore*crore manmadhA's. manasijan=manmadhan; he is born out of mind - manas. Love - kAmA - comes from the mind, right? There is a puranic story too - Manmadhan is the son of Mahavishnu. But very strangely, he was not born to Mahalakshmi out of Vishnu's love, but from Vishnu's mind directly - the moment Vishnu thought of him! And Vishnu's other son, Brahma, was born directly too, from Vishnu's navel (nAbhi). See, Vishnu has this funny habit of doing strange things always! Manmadhan is famous for his good looks. So 'manasija kOti kOti lAvanyAya' is some one who is crore*crore times as beautiful as Manmadha. But is this not funny?! I mean, Subrahmanya being 'manasija kOti kOti lAvanyAya'. Who is Subrahmanya? He is the son of Shiva, who reduced Manmadha to ashes with a fire of fury from His eye. And from that same nEtragni, is born Subrahmanya! But He was born to gnAna (wisdom), not kAma. 'Kumar' is a special name for Him. Just as in the South 'pillai' (son) means pillaiyar (Ganesha), Kumar in the North refers to the younger son, Subrahmanya. In the South also, we say 'kumaran' or 'kumAraswAmy'. Nowadays, half of the boys are named 'Kumar'! The term 'Kumar' is particularly applied to Subrahmanya. In Valmiki Ramayana, Vishwamitra tells the story of Subrahmanya to Rama and Lakshmana and calls it 'KumAra Sambhavam'. And Kalidasa has named his own epic after this phrase used by the great sage Valmiki. Another interpretation for the word 'Kumar'. Manmadhan is also called 'mAran'; and 'kumAran' some one who puts mAra to shame - is more beautiful than him. 'kutsitha-mara:' - 'kumAra:'. So 'kumAra' by itself means 'manasija kOti kOti lAvanyAya'! The Tamil people just love Him. They have given Him a beautiful name - 'Murugan' - Murugu=beauty. After kAmA was burnt to ashes, Devi took over his role, donning his sugarcane bow and floral arrows - 'kamEshwari' - this led to the birth of Subrahmanya. And how else would be but 'lavaNyA'? - Devi Herself is called 'sundari - thripurasundari'.